Country Music Television has just premiered the music video for James Wesley’s “Hooked Up”, directed by Alex Manning and featuring lots of creative cinematography including aerials shot by (yours truly). The aerials for this project were some of the most challenging and rewarding shoots we have ever done. They were accomplished over the course of three days at Morehead City on the coast of North Carolina using our heavy lifter octocopter flying a RED Epic Dragon on a MoVi M10 three-axis camera stabilizer gimbal. On the first day, we arrived in downtown Morehead City, NC where country artist James Wesley was to have a waterfront concert that evening. Thankfully, we had the full support of the city, so we would be able to achieve the shots we needed without endangering the growing crowd filling the streets. As night fell, the concert began and we flipped on our orientation lights and took to the sky. The concert was put on primarily for the music video shoot (the ground production team was shooting at the same time we were), so James Wesley performed “Hooked Up” three times in a row before continuing with his set. This gave us three passes at shooting, with just enough time for lens and battery changes between songs. Overall the night went very smoothly and the footage of the lit-up waterfront concert turned out pretty stunning. On day two, we packed our essential gear into a gameboat and took off over 30 miles off the coast to a stunningly blue region of water called “Big Rock.” Unfortunately, despite being a relatively calm day, the 2ft-4ft swells that far out on the ocean made this one of our most difficult shoots ever. 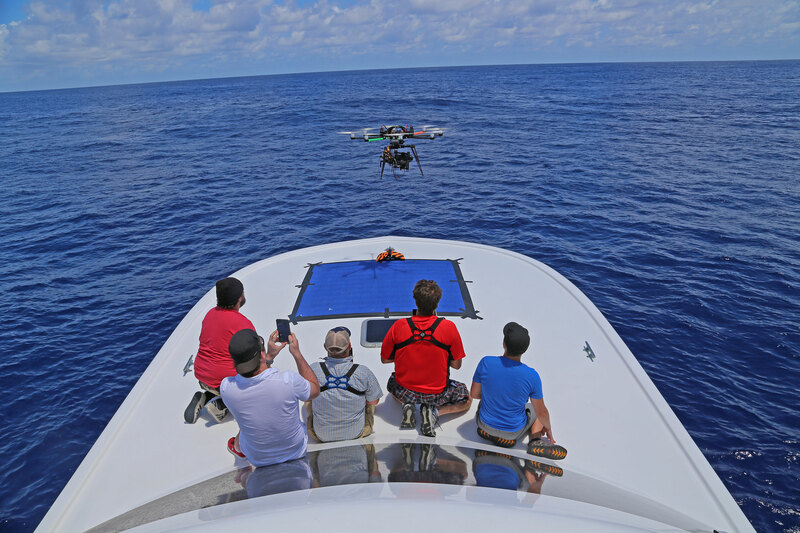 We had to rig a harness system for our octocopter in order to get it to the bow of the boat safely. Once there, we had to assemble and prepare the drone and gimbal for flight all while riding swells and rocking around. When it came time to take off and later to land, we had to be careful to time it to the calmest moment in order to reduce risk of a wave throwing the drone off balance. Despite all the challenges, we achieved two very productive flights and returned to shore safely. The final day, we woke up extra early and headed to a smaller boat before dawn to head out to an inlet where a parade of tournament fishing boats would be heading out to sea shortly after sunrise. We made it in time and managed to get some pretty remarkable shots of gameboats bathed in the beautiful early morning light. While we were out, we were also able to grab a couple shots of James Wesley singing and playing on a nearby beach. All in all it was a productive morning despite battling wakes in a smaller boat. Later that afternoon we were able to pick up a couple of aerials of downtown Morehead City, but rising wind soon overpowered our mighty M10 and encouraged us to call it a day.